In this, the first of his 58 documentary films, John Pilger combines candid interviews and amazing frontline footage of Vietnam to portray a growing rift between the US military bureaucrats - "lifers" - and the soldiers who physically and mentally fight the war on the ground, the "grunts". By 1970, it is an internal sense of disillusionment and frustration born from this rift that is triggering the withdrawal of US forces from Vietnam. As the US employs psychological warfare against its enemy, Pilger finds himself unable to glean significant information from the military; a press conference he attends is nicknamed "the 5 o'clock follies" for the evasive nature of the proceedings. And so it is with the grunts, the "wheels of the green machine", that Pilger finds a very human side to the US presence in Vietnam: soldiers who are at once ready to serve their country and doubtful of their purpose there. Plied with visits from Miss America and ignored by Vice President Spiro Agnew, they experience the war in a way many of their superiors do not. 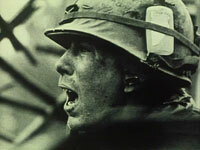 Filmed at Camp Snuffy in 1970, THE QUIET MUTINY presents a character study of the common soldier during the Vietnam War, revealing for the first time the shifting morale and open rebellion of Western troops.